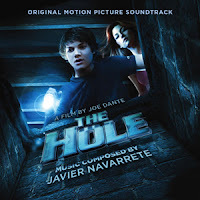 La-La Land Records and Bold Films present the original motion picture score to the feature film coming-of-age-horror-fantasy THE HOLE, starring Chris Massoglia, Haley Bennett and Teri Polo, and directed by Joe Dante. Acclaimed composer Javier Navarrete (PAN'S LABYRINTH, MIRRORS, WRATH OF THE TITANS, 47 RONIN) finds the perfect pitch for Dante's thoughtful spookfest, fashioning a beautifully haunting orchestral score that is worthy of following in the footsteps of the director's previous collaborations with composer Jerry Goldsmith. 5/5 I am a huge fan of Javier Navarrete ever since the score to "Pan's Labyrinth" knowing how to push the edges in corners of your mind. Musically of course, but bringing the into this more of an adventure creepy adventure... you will be pleased!